Born in 1969, in Osaka, Japan. In my childhood, I grew up in the circumstance where I saw a lot of fishermen among my family or friends, so I felt that it was quite natural to start to enjoy fishing. Helping my family business, decorative metal work production, I enjoyed fly fishing from high mountain streams (they look like falls to you!) to the wide rivers in rural areas, though such areas were not seen as fly fishing fields then. Since I was 23 years old, I started building split bamboo rods through self education. At first I handed my spinning and bait reel rods then fly rods to my friends to try them. With my turning point coming, I decided to be a full time rod builder when I was thirty. As I understood the hardship of craftsmanship when I was a child, I tried harder and harder to "make good stuff at all." I dedicated myself to building fly rod blanks, though it meant OEM business. At the same time, I enjoyed dry fly fishing in near fields and dug wet fly fishing and tying which was then booming in Japan. During 5 years of this period, I assembled 150 to 180 blanks a year. It might have been the limit of an individual maker's production scale on hand planing method. 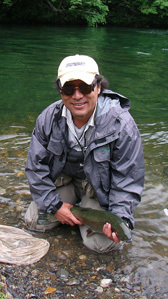 When I was thirty-two, for the purpose of searching for the understanding of relation between rod performance and bamboo characteristics essentially, I moved to Tokachi, Hokkaido, the blue ribbon field of fly fishing in Japan, and staying here since then.